50-60 is fine. Anyways, if it is too humid, stuff will mold. Well, it seems the gauge I have it broken - so I don't know at the moment what it is, but it is low (50-60 range) in the house right now, and I can't keep it maintained. The temperature is fine. . . So, what is your humidity??? My husband has named most of the animals in our house haha. I do not have an UTH yet, but it is on my list of supplies to buy in the next week or so. The room they are in has been staying at 76-78. I am having more of an issue with humidity in the tank. Do you have an UTH (Under Tank Heater) for your hermies??? Your hermit crabs' names are very cute!!! I especially like Seacil, Wasabi, and Sushi!!! I have 3 hermit crabs named Romeo, Elmo, and Juliet. . . They are housed in a 30-gallon glass aquarium with EE (Eco Earth) as their substrate. . .
Also, what substrate/substrates do you use??? Hello, welcome to Hermit Crabs ~R~ Us!!! Would you like to be my friend??? 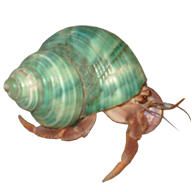 How many hermit crabs do you have, and how many gallons is your crabitat??? ~*Jay*~ Momma to 3 dogs, 2 cats, 2 kids and our hermie bunch!